“There’s only one way,” David Hasselhoff, star of Baywatch and Knight Rider, used to say when he was in pantomime, “the Con-way”. The US actor, who has appeared in seven pantos from Nottingham to Cardiff – always as Captain Hook – was referring to Jon Conway, a man who has been involved in pantomime for decades. 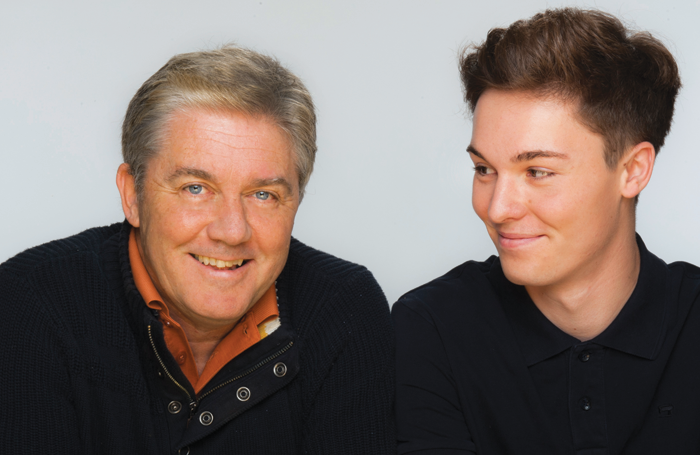 Alongside Nick Thomas, he co-founded pantomime production company Qdos Entertainment back in 1995, which at its peak produced more than 30 pantomimes each year, and set the modern standard for commercial panto. Conway stepped down in 2013, and had put the world of panto behind him, focusing instead on exhibitions and large-scale events. But in 2015, the worlds of pantomime and supersized spectacle collided when Conway created what he billed as “the world’s biggest panto”. He was approached by the Birmingham NEC Group to put on a Christmas show. “The arena was traditionally dark at that point,” Conway explains. “They didn’t particularly want a pantomime, and neither did I want to do one. But we threw a few ideas around – a circus show, a winter wonderland – and I said, ‘Or we could just put on the biggest pantomime the world has ever seen’. Sure enough, when December rolled around, Birmingham Arena opened its doors to Cinderella with actor and TV presenter Walsh, a large cast and an even larger castle. 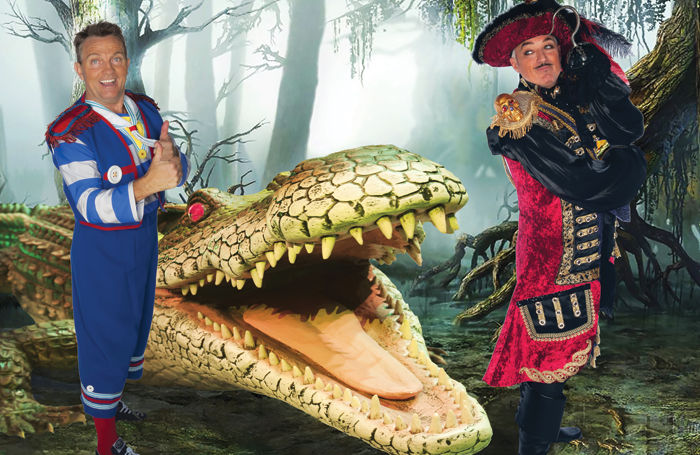 Conway’s aim to continue the concept with Snow White in 2016 ran aground when he fell ill but now, back to full health, he is staging Peter Pan – An Awfully Big Arena Adventure. There is no Hasselhoff as Hook but it does star Walsh again, alongside former Spandau Ballet singer Martin Kemp. 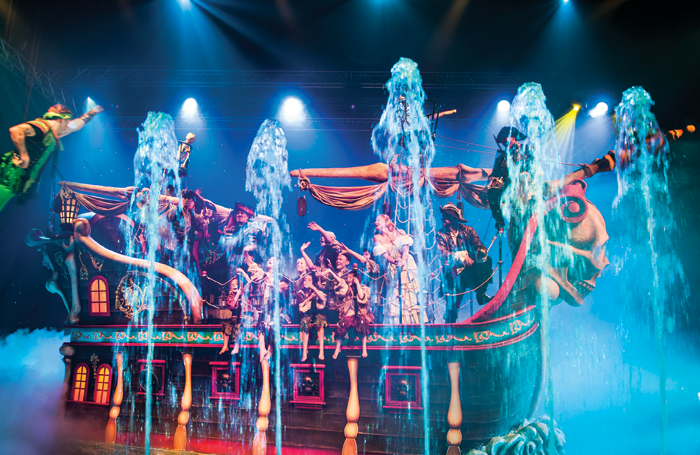 The spectacle this time around includes a seven-metre animatronic crocodile, a colossal pirate ship, computer-generated animation, BMX stunts and a wall of water. The budget, as a result, is £2 million. Conway has been testing and expanding the concept of a supercharged panto in various ways across the world, including a Mandarin-language version of Aladdin that toured China, before moving to a casino in Nevada. And Conway is honest about the fact that 2015’s Cinderella taught him a few lessons. So, 15 months ago Conway and Walsh put together a wish list of what they wanted to do for Peter Pan. “The first thing was that every seat should feel like a front-row seat at some point.” No small feat in an arena seating 4,000 audience members and a stage that measures 100ft long, 100ft deep and 40ft high. Conway also wanted the pirate ship to travel around the arena with water fountains going off in front of it. “Then there’s the whole CGI influence, with LED screens,” he says. “Finally, when we fly the screens away you reveal a Neverland set, which is 40ft high, and has three real mountains on it that become BMX ramps for trick cyclists. So how does he direct something this big? 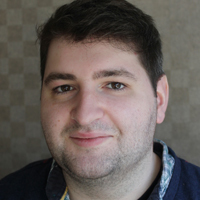 “We rehearse it in kit form, because the cast is 120, plus 50 technicians. “What I found when we did Cinderella is that, when I called them all for notes, it took 25 minutes to assemble them. I was playing to a bigger audience than some matinees,” he jokes. When we meet, just over a month before it opens, Conway has rehearsed the circus performers, the stuntmen, the music, the comedy routines. But he only brings everyone together a week before the show opens. Still, he is confident that “everyone will know what they’re doing when they turn up”. As if the production weren’t Conway-centric enough, his 19-year-old son Jordan has developed all the CGI. Fifty-foot LED screens will display a virtual Neverland, which has been created on the Unreal Engine software, used to design video games such as Assassin’s Creed and BioShock. The screens add another challenge for factotum Conway, however, because he is essentially directing the show twice: first as a stage director, second as a film director. The younger Conway has also programmed the Bluetooth-controlled, seven-metre animatronic crocodile that eats Captain Hook. “What Jordan’s got is all the technical wizardry that’s available to kids nowadays, he thinks in a completely different way. The prices are also kept low to attract audiences who, Conway hopes, will re-attend. 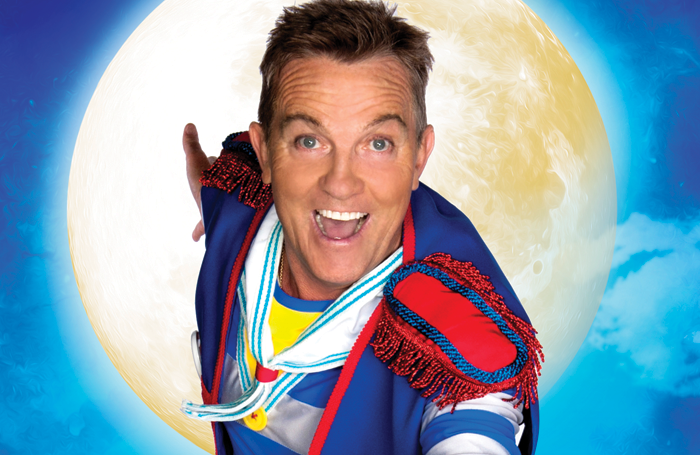 Peter Pan is by no means the end for the world’s biggest panto. Conway has a five-year plan that includes expansion to other arenas nationally, and beyond. For the man who helped create modern panto, it is surprising when he reveals that he rarely sees pantomime these days. “I still love it and respect what everyone does, but I don’t want to look backwards.